Like I mentioned, it is not a WCAG 2.0 violation. Down arrows are reading it just like it is coded and intended to be used. I pasted your code into an html file and it sounds correct to me for how it is coded. Good luck if you feel you need to investigate this more. I’d say you are looking for something that is not there. Hi Alan, thank you for your input and sorry to be unclear. We are trying to distinguish whether this is a WCAG 2.0 violation or normal screen reader behavior. 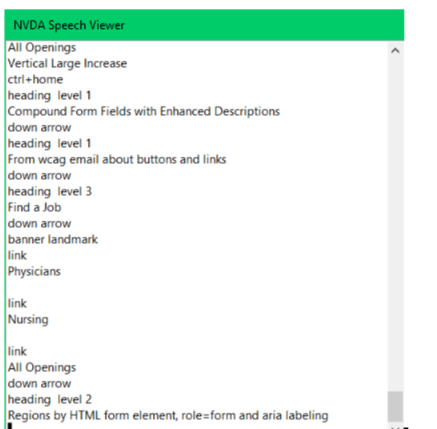 When using the down arrow key (read next item) on the three buttons NVDA says “Banner banner landmark clickable list” and moves onto the next section of the webpage. Is this a WCAG 2.0 violation since the individual buttons can be comprehended and accessed using the tab key, but not with the arrow key? I’m not sure what you are trying to fix. The enter key is used during tabbing to select the links/buttons or selectable elements, which you said works in your original email query. When you use the arrow keys you are navigating the DOM or code and you will hear things but you cannot select them with the Enter key in most cases. It is not for that purpose. This is used by actual users of screen readers to navigate the page and content to hear what is on the page. Arrows up and down go through the code, line by line, arrows left and right will go through words and sentences. You should hear the same thing as when you put focus directly before the heading in this case, and it may be way before it for that matter. Then make sure you are in Browse mode for NVDA or Virtual PC Cursor on for JAWS and use the Ins+down arrow key to have the screen reader read from that location. You are now listening to the page as it is coded without css repositioning and other tricks used for visual presentation. 1. Your buttons/links are keyboard accessible, period. 2. You making more of this than it is. We re-tested with JAWS 18 on IE and Firefox and got the same results as with NVDA. When we tested the linked buttons using only the keyboard (no screen reader) with Firefox and Chrome, each button gets focus (highlighted) and we can use the enter key to follow the link. We will work with the developer to see if scripting and tabindex are the culprits. Thank you, everyone, for the useful suggestions and information. This code will improve the semantics by getting the screen reader to announce a list with three items, but if you position the <li> all on one line, NVDA will still read out all the links on one down-arrow. It’s always been silly that NVDA has done this, I wish it didn’t take any note of the CSS in this regard. My working hours are 11am – 7:30pm AEDT. Correction to my prior post. I mention onmouse attribute when I should have said onclick. This email may contain confidential and privileged material for the sole use of the intended recipient. Any review, use, distribution or disclosure by others is strictly prohibited. If you are not the intended recipient (or authorized to receive for the recipient), please contact the sender by reply email and delete all copies of this message. Please click here for Company Registration Information. In Jaws and not 100% sure with NVDA. The default for Jaws is to automatic activate forms mode. Buttons and links are not triggered by this mode. Thus enter will activate the button/like. Forms mode is activated for those elements which you need to interact with such as a radio button, combo box, edit, etc. Based upon your output: I notice NVDA announced clickable when using the arrow keys and the code did not show any onmouse attribute. From my recollection this is what causes the screen reader to announce this role. If keyboard support is not present for the clickable (onmouse) then the enter key will not activate. Another question, if the forms mode is being activated, are you using ARIA and if so, are you using the application attribute? I only ask this is because the wording of the question indicates form mode is being activated with NVDA which gives a different behaviour. If so, why are you using this mode? I have question regarding arrow keys vs. the tab key using NVDA and Firefox. When I use the tab key on three buttons (see screenshot below), NVDA announces each one individually as I tab and they are accessible using the enter key. I believe this is called focus mode. However, when using arrow keys it announces the heading level and a clickable list (see speech output below). I believe this is called browse mode. Using the arrow keys, NVDA doesn’t announce each button individually and I cannot access the link with the enter key. Is this a WCAG 2.0 violation since the buttons can be comprehended and accessed using the tab key, but not with arrow keys? I appreciate anyone’s insight into this. Next message: Sean Murphy (seanmmur): "RE: tab vs. arrow keys with NVDA and Firefox"
Previous message: Subramanian, Poornima (PCL): "RE: interesting simulator"
In reply to: Schafer, Carmen: "RE: tab vs. arrow keys with NVDA and Firefox"
Next in thread: Sean Murphy (seanmmur): "RE: tab vs. arrow keys with NVDA and Firefox"